It's not often that I find myself feeling the kinds of feelings that I was when I started reading Before Watchmen: Minutemen #1. Darwyn Cooke starts off with, what I read as, a commentary on what Alan Moore has meant to the comics industry. It's veiled as Hollis Mason speaking about what it meant to the rest of the costumed hero world when Doctor Manhattan stepped onto the scene and could fly and evaporate a man with barely a stray thought ... but it's also the kind of language that has oft been used to describe what it was like working in the comics industry (or for that matter reading comics) when Alan Moore crossed the Atlantic and started shaking things up in the world of American comics. The book begins with respect. And I think that is the most important aspect to what the book continues through to the final pages with. Are there some missteps? Of course. As has been mentioned online on many forums there is a bit of confusion between what is Hollis' novel and what is his internal monologue, which leads to some misinterpretation on the part of some readers. It's something that will be infinitely easy to fix in the collected edition. So let's talk about the feelings that I had when reading the comic. The first was relief. Relief that the book was going to be as good as I had hoped. That it wasn't going to be trite like I had feared. That it was as finely a crafted a comic as what I held in my hand. Relief isn't a feeling that you often have in the world of comics. Especially not when you've been reading them for close to 25 years or more. You try to not let your expectations build when you've been burned. And this was one of those rare times where I had let my hopes get past where I am usually comfortable letting them go. The internet is ablaze with people who are looking at this as a cash grab, as a slap in the face of one of the better talents that has ever plied his skill in the world of comics, as the last scrapings from the bottom of the barrel. This book is not that. This book is another great, unique voice in the world of comics showcasing what he can do with a finely crafted character. What he can do with one of the most well developed worlds to ever grace the pages of comics. Which brings me to my second feeling. Awe. Darwyn Cooke has been one of my favorite creators since I first became aware of his work in the world of comics. And I feel like this is one of his finest efforts. He puts to use all of his abilities as a story teller and crafts a great, if not at times moving, story. Cooke's Hollis Mason is wistful. Is brimming with the desire to be able to return to a younger man's game. But at the same time seems comfortable with his decision to leave the world of heroics. The third feeling I had while reading Minutemen #1 didn't come until the end of the issue. Anticipation. 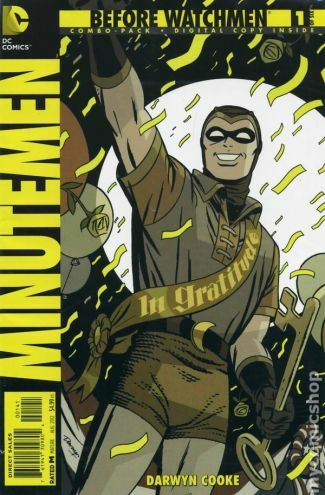 I truly feel that if the rest of the Before Watchmen titles manage to even measure up to half of the first issue of Minutemen that the internet is ablaze for all the wrong reasons. These titles have the opportunity to serve as such a great supplement to what is considered to be the best graphic novel of all time. While I don't think that they will outpace the original, I don't think that was the intention. I think that the hope was that for those whose only experience in the world of comics was the pages of Moore & Gibbon's Watchmen to have something to entice them to try out other comics. To make them see that there are a bevy of other creators out there who are hoping to make their stories new favorites. If anything I hope that people will put their prejudices aside and pick up the book and give it a read. I think it has the power to change even the most concretely held opinions.